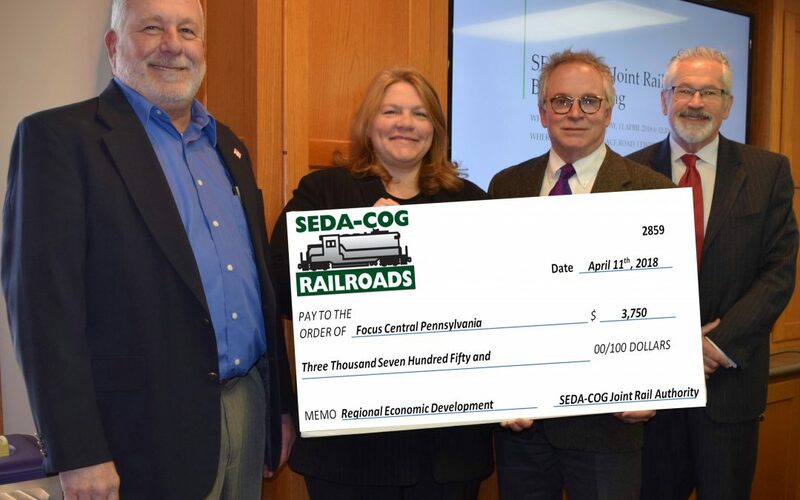 Lewisburg, PA – SEDA-COG Joint Rail Authority (JRA), owner of five short line railroads in Central Pennsylvania is investing $3,750 for 2018 to support efforts of Focus Central Pennsylvania to promote the region to attract new corporate investment. A check was presented by SEDA-COG JRA’s Board Members Union County Commissioner John Showers, Citizens’ Electric President Eric Winslow and Executive Director SEDA-COG JRA Jeff Stover to Lauren Bryson, Focus’ Executive Director. “The JRA is proud, once again, to support the good work of Focus Central PA to help us locate more rail-served industries on our system” said Jeff Stover, Executive Director of SEDA-COG Joint Rail Authority. The Lewisburg, PA based JRA is an eight county municipal authority offering the best of public ownership of the trackage and fixed facilities, while freight service to customers is handled by the private sector through an agreement with the North Shore Railroad group. The SEDA-COG Joint Rail Authority’s mission is to preserve and foster rail service in Central Pennsylvania and to further economic development through retention, improvement and expansion of the infrastructure and the rail service it supports. The Rail Authority has reinvested $43 million into upgrades and replacement of rail facilities and development of additional tracks to serve new industrial sites. “Focus’s investors provide the financial resources that allow Focus to implement strategic pro-active marketing programs to attract quality, family-sustaining job creators to its seven-county region. With the SEDA-COG Joint Rail Authority investment, Focus will be better able to more strategically market to companies requiring reliable rail service to be competitive and successful. Attracting quality companies is fiercely competitive so these resources from investors like JRA are invaluable for Central Pennsylvania’s marketing efforts to attract new jobs and capital investments to Central Pennsylvania.” Lauren Bryson, Executive Director of Focus.